The epic battle between the bears and bulls rages on with this completely annoying seesaw action all dominated by the short-term interventions in the Japanese yen versus the U.S. dollar/Chinese yuan. I frame it as such because the yuan is pegged to the dollar and relations between the Chinese and the Japanese are about as good today as they were in 1894–1895, and not much better than in 1939. (Google search "Sino-Japanese Wars" to observe their history of animosity). The good news, if there is any, is that this is a currency war, as opposed to a "boots on the ground" war, and I am convinced that it is a function of two large Cray supercomputers struggling to outmaneuver one another in manipulating the Japanese yen in one direction or another. The Japanese would love to see the yen collapse against the U.S. dollar, making Japanese goods cheap in terms of both U.S. dollars and Chinese yuan while placing the edge in international trade firmly in the lap of Tokyo. Beijing, however, wants the yen to soar against the dollar and the yuan, making Japanese goods less competitive and thus giving the edge to the Chinese. In the old days, these two Asian gargantuans would be mining each other's harbors and blowing up foreign embassies, but since mankind has reverted to more civilized methods of international conflict such as cyber-warfare and "Space Invaders-style" currency combat, the overt remnants of conflict can only be seen on a Bloomberg terminal. The chart above overlays the gold price on top of the yen-dollar going back to the top of the precious metals markets in late 2011. It is astonishing how perfectly correlated the two are. The Bank of Japan has been working diligently to absolutely trash the purchasing power of the yen with QE-to-infinity policies and now negative interest rates. 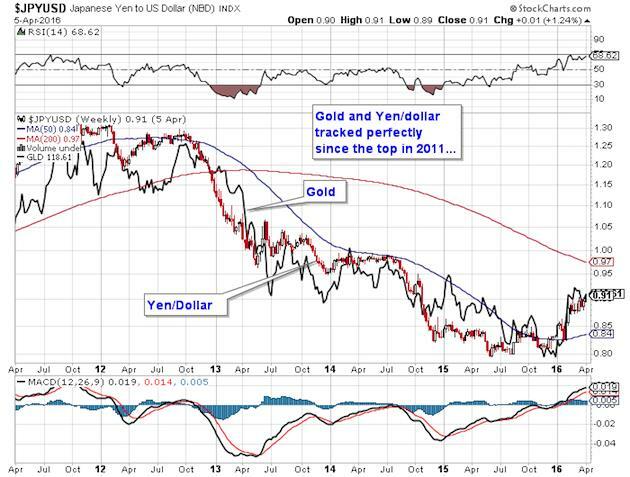 But, in the middle of last year, for some strange reason, the yen suddenly reversed, and after peaking in late 2011 at over 1.30 (at nearly exactly the point where gold topped), the yen has been moving higher versus the U.S. dollar. What is interesting to me is that these knee-jerk intraday movements in the Japanese currency do not look NATURAL; they look as if someone is probing an exposed nerve-ending with a cattle prod. To get a sudden 50-bps reversal within seconds of a new low or new high intraday price point is not only strange, it is dangerously bizarre, as many of the equity-based pair trades respond by whipping the stock futures around like a kite in a windstorm. The bullion bank behemoths are doing everything in their power to keep the lid on gold and silver prices but the longer we are witnesses to this resistance of my beloved gold miners to these egregious raids on the Crimex, the more the likelihood that this epic battle will be resolved to the upside. The HUI yesterday achieved a new closing high for the move since Jan. 19, and while it didn't take out the intraday high from St. Patrick's Day, it is within a hare's breath from doing so. Since I have been a vocal proponent of the predictive qualities of the gold miners in telegraphing moves in gold, I have had to really dig down and assess whether or not this wonderful move in my beloved miners is a simple valuation "decompression" coming off the absurd lows of January (that were created by a forced liquidation within one of the crude-oil-sensitive sovereign wealth funds). Was this move in the miners predominantly short covering or is it something much larger with mammoth capital flows re-entering the sector? 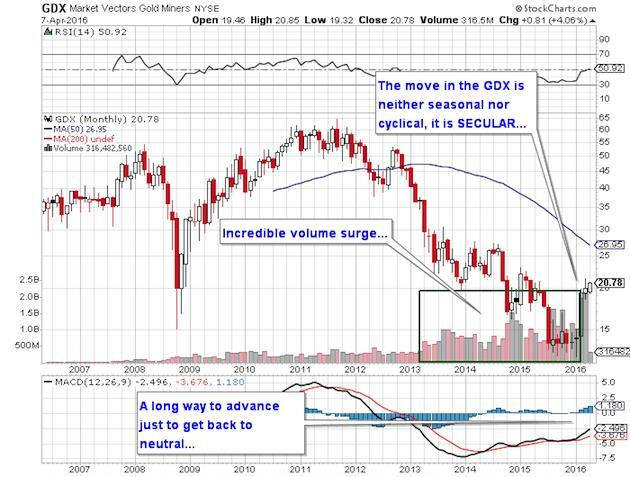 Take a look at the GDX shown below from a monthly perspective. The standout here is VOLUME and if one subscribes to the old adage that "volume precedes price," the fact that volume in March stayed incredibly strong is a testimonial to the efficacy of the move. Furthermore, looking at the Histograms, you can see that the move could continue for months just to get those lines back to neutral. Bottom line: The gold and silver miners look spectacular. OK, so the Chinese are breaking the BOJ's stranglehold on the dollar-yen and the miners look great—how does that speak to the actual metals themselves? Could we see a 260 HUI and a $1,160 gold price? The HUI was incredibly underpriced in the later half of 2015 with a final crescendo of liquidation during the third week of January 2016. Everyone in the fund management business will use terms like "regression to the mean" or "mean reversion" (because they like to have you think they are "quants"), but the reality is that gold mining stocks may have less predictive value today than in prior periods because of just how compressed they got. Another way to look at the relationship between gold bullion and the gold miners is seen below: the gold-to-gold-stock ratio or GLD-to-$HUI ratio. 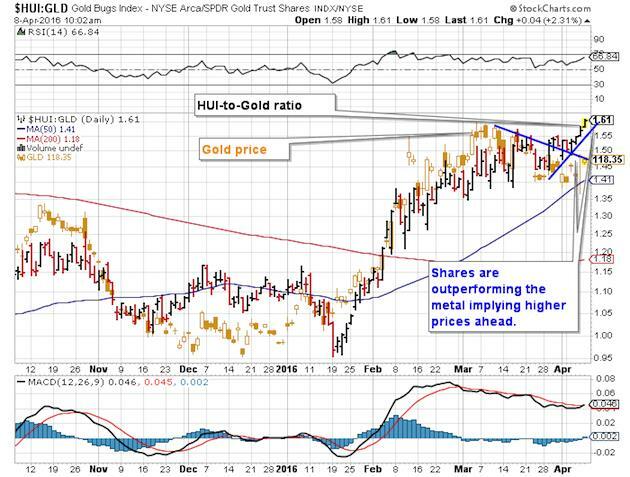 The gold miners are on wheels again this week with the $HUI-GLD ratio hitting new highs yesterday and again this morning as the Junior Gold Miner ETF (GDXJ)(which I have held since early December) has hit a new high for the move and the year touching $30.33. With the miners in gear and the dollar-yen in retreat, one would have to believe that the long- and intermediate-term trends, which I referred to back in late February with my article "Patiently Climbing Aboard the New Golden Bull," have shrugged off the historically deviant effects of the Commercials allowing the Golden Bull to forge forward, showing ultimate disdain for the irritating gnat-like bullion banks with a snort and the flick of a tail. In that article, I concluded the piece with this: "I see a sharp correction starting in mid-March, the severity of which will give me a clue to when and what and how much I buy. To wit, the operative and critical thought to take away from this missive is this: I WILL be a buyer of gold, silver and the mining stocks into the next correction and the risk I take is that there IS a correction. If I am wrong, then this bull market will have policemen turning in their badges and the bullion banks following the rules, both Black Swan events of the highest order." So in a few hours we will get the ominous COT Report and while we certainly cannot bet against the Commercials, I will be fascinated to see if they have been forced to cover by the raw power behind Western investment demand and the dominance of the long- and intermediate-term trends. In the interim, let us celebrate the return of the Golden Bull and pray like hell that the silver can jump into the fray so that this becomes a REAL party instead of just an after-work cocktail.